After a long day of teaching English, this evening’s activity was watching Mystery Science Theater 3000. I don’t think I need to mention that we also drank beer – it’s pretty much impossible (and not at all recommended) to watch MST3K without some kind of cushioning for your brain. Tonight’s bad, bad movie was Hercules from 1958. It was a low budget Italian movie that somehow was popular enough at the time to start the “sword and sandal” genre. The movie industry must have been pretty awful in 1958 for this bomb to become popular. Even the MST3K crew couldn’t save this stinker. Perhaps we needed more beer. Teaching English overseas is a fun way to make some money and have some life experiences. Finding the right balance of experiences and saving money can be a challenge. When you are away in a fun, exciting, foreign country like Japan for a year or less, you want to get out and do everything that is available. It’s easy to end up spending as much or more than you earn. The teachers who hang around longer than a year all find different ways to balance experience vs. savings. I have been doing my best to send some money home to pay off student loans while still getting out and experiencing the country occasionally. One of the best ways I have learned to save money is to find something fun to do at home instead of going out to the izakaya or karaoke for the 900th time. Tonight, in the interest of being fiscally responsible, I invited some people over to watch Mystery Science Theater 3000 presenting the classic film “Deathstalker and the Warriors from Hell”. Please note: the term “classic” is not an indication of quality in this case. DSatWfH is actually the third movie in the Deathstalker series. It’s the kind of movie you would get if a group of rich teenagers decided to act out their latest D&D session using only props and costumes they had around the house. Although I did save money by staying in, I ended up spending more than expected on all of the beer I needed to survive this movie. Recently I have been watching a lot of Mystery Science Theatre 3000. For those unaware, it was a show where evil scientists have sent a janitor into space and force him to watch terrible movies. The janitor has created robots to watch the movie with and they make funny comments throughout. Tonight I watched one of the absolute worst crap fest movies that has ever been featured on MST3K – Manos: The Hands of Fate. Manos is typically near the top of any “worst movies of all time list”. It was filmed on a hand wound 16mm camera that could only record 32 seconds at a time with no sound. Three actors later “performed” all of the voice acting for every character. In addition to the complete lack of production values, the movie features an undecipherable plot featuring a lost family, a cult, and a guy with a terrible cape. I have watched a lot of terrible movies on MST3K, but this was by far one of the worst things I have ever seen. It was so bad that the mad scientists actually apologized half way through. There was literally not enough booze available to make this movie good. It was so bad, it almost made Catwoman seem like a good movie. If you ever feel like punishing yourself, get a few bottles of your favourite alcoholic beverage, a few friends (who likely won’t talk to you after), and track down the MST3K version of Manos. But remember – I warned you. (2015 Update) Oh no! It’s available for free viewing on the official MST3K channel on Youtube here! I’m so sorry. Today was a total geek day. There was yet another teacher party in the evening, but I declined and decided to spend the evening in. Super Dave came over after finishing work and brought his portable hard drive. 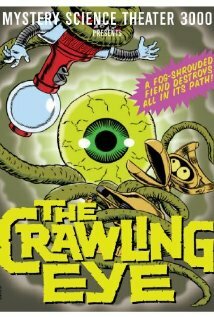 We traded some movies and TV shows while watching Mystery Science Theater 3000 presenting “The Crawling Eye”. Hanging out and watching robots make fun of terrible sci-fi was a lot of fun and a nice break from another night out at the izakaya. Warning: Do not attempt to watch The Crawling Eye (or any other MST3K) without ample beer on hand. It will break your brain. There was a very loud argument which almost turned into a fight outside my apartment building after work. This is a very rare thing to see in Japan, so naturally Palmer and I cracked a beer and watched from our balcony. Many of the neighbours were doing the same thing (although most weren’t drinking beer at the same time). The highlight of the confrontation was when the loud drunk guy ran full speed into a fence for no apparent reason. Ouch! He got up and kept arguing, and eventually the show ended and everyone went home. After that we had a few beers and watched Requiem for Dream, which is a really good, incredibly artistic, and very depressing look at addiction. No, I didn’t miss the irony of drinking beer while watching a movie about the dangers of addiction. August 30, 2005 – Amy! Yesterday I spent the day watching TV at my parents’ house in Portage la Prairie, so I decided to get out of the house and drive to Winnipeg for shopping, a movie, and wings with the regular wing group. After buying some clothes, I treated myself to sushi lunch at Sushi train. I have been back for over a week, and I was craving sushi. I was also interested in how Canadian sushi would compare after eating really amazing sushi in Japan for the past few years. The taste was pretty good, but the presentation was nowhere near Japanese standards. Today’s movie was “40 Year old Virgin” which was hilarious. One of the most memorable scenes involved actor Steve Carrell actually getting his chest waxed, screaming in pain, and shouting obscenities. I am not a hairy person at all, but I still cringed! Ouch! The last time I returned to Canada, I wrote about going out for wings and karaoke with the regular group. Amy, one of the regulars, was upset that I didn’t mention her by name in my blog post. I tried to explain to Amy that I rarely use names in my blog, but Amy was upset anyway. So Amy, here is your name in my blog. Amy Amy Amy Amy. 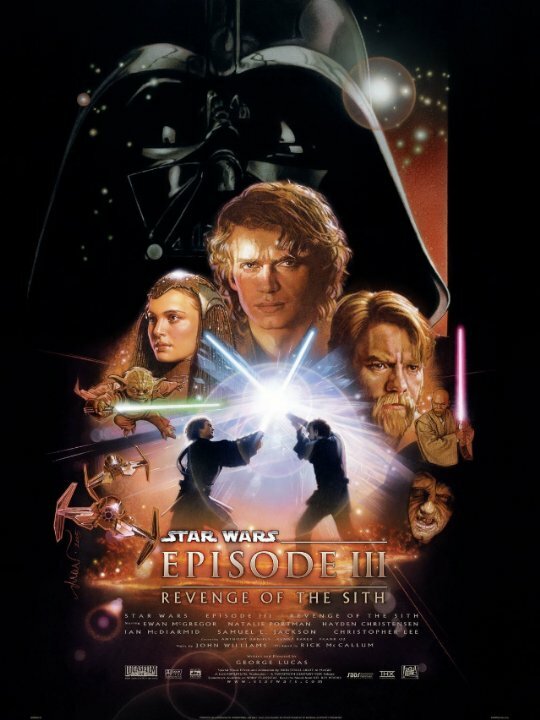 Today I finally got to see Star Wars Episode 3. The Penpal and I went after she finished work. Thank you George Lucas for not screwing this one up! Have I mentioned how happy I am that Japanese people prefer subtitles to dubbing? Otherwise I would not be able to see movies in the theater, or at least not be able to understand most of what’s happening.